How many times a week do you stare into your fridge, nothing prepared, and say out loud “I need to eat and I need to eat NOW.” Me: 5 to 10 times a week on average, on a good week. I’m pretty horrible at “meal planning”. Like I PLAN to eat at least 3 meals a day, but I’m no good at planning what those meals will be. Lately, I’ve started to think at least 24 hours in advance and it’s saved me a lot of curse words. I’m going to store those up for a later date. Like when Macy’s smells like dust and polyester and I wonder what the _____ I’m doing in there. I have a hard time clothing shopping in public these days. Most of my purchases are made online in hopes of the item not looking terrible. If it’s a 5/10 or greater I keep it, rather than hassling myself with a return. I also care almost zero about clothing these days, so that helps. I don’t walk around looking like a schlep, I just don’t go all out like I used to (high-waisted skirts, tucked in blouses, statement necklaces, 4-inch pumps). Nothing sounds more horrible than what I just typed. I now go for comfort. I have a favorite pair of black leggings that look good no matter how much I weigh (that tends to fluctuate) and I know what looks good on my petite frame: long asymmetrical, lightweight, not too baggy shirts and sweaters with knee high slim boots. Now everything in my closet resembles this outfit in some way but that’s okay. I can’t help it – Whole Foods really knows my style. Yes, that’s right, almost all my shopping is done at the same time as picking out 3 pounds of wild-caught sockeye salmon for chowder that evening. It’s a very gratifying and thrifty experience and it’s one of the only places I can get organic cotton and fair trade clothing without feeling like a sweet 4-year-old hastily sewed together my knits. I’m not negating child labor with that statement; I have found it increasingly difficult for me to shop at typical retailers like GAP and LOFT these days. I only like to support retailers that serve well-raised animals, so why wouldn’t I want to support clothing retailers that treat humans like humans should be treated! Unplanned rant for the week. Sowwy. About this recipe a little more: I made this basil pesto vinaigrette for my friends this weekend over a spinach salad. It was way too amazing to not develop into a recipe so this evening when I saw grass fed beef and a lone butternut squash in my kitchen just pleading to be eaten. 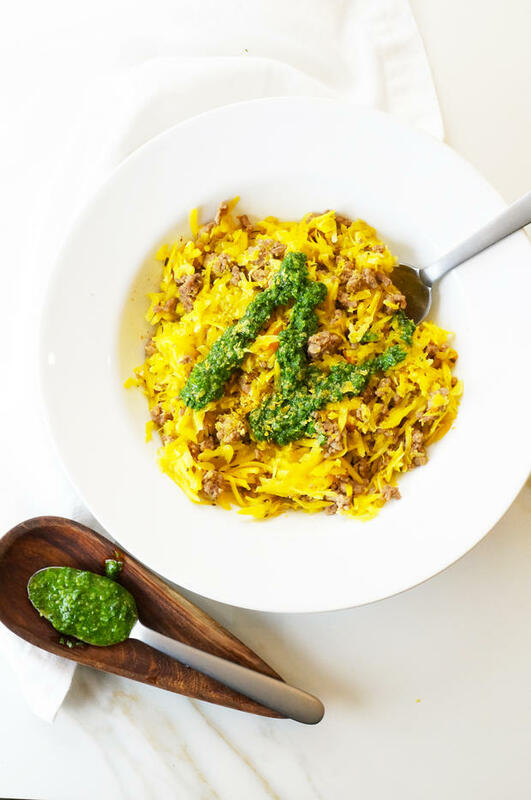 I wanted to keep this recipe super simple for a weeknight meal and let the basil pesto do all the talking! If you want to add more greens, definitely throw in several handfuls of spinach when you add the bone broth and let it wilt! You can even add chopped roasted garlic, minced shallot, extra basil or parsley, whatever your sweet little heart desires! And it makes awesome leftovers!! This was my first dish using my NEW Cuisinart 9-cup food processor! And I am obsessed. You can make all different types of vegetable “rices”, thinly slice sweet potatoes to make homemade sweet potato chips in the oven, pulse small amounts of hard to chop foods like garlic & herbs and make the easiest chunky guacamole you ever did see! If you haven’t finished your holiday wish list you MUST add a food processor so you can get even more creative in your kitchen!! Make butternut rice by running cubed squash through your food processor using the shredder blade attachment. Scoop into a separate bowl and set aside. Wipe down food processor bowl so it will be clean when you make the pesto below. Heat a large skillet over medium-high heat. Add ground beef in skillet and season with sea salt. Cook beef, breaking up into small pieces, until browned and cooked through, about 3 to 4 minutes. Add butternut rice to the pan and toss well with the beef. Pour broth into pan, bring to a boil, and cover with a lid. Cook for 2 minutes until butternut is tender. Remove lid and cook for a couple more minutes until most of the broth has evaporated. Season with lemon juice and remove from heat immediately. Meanwhile make pesto: Place all pesto ingredients in clean food processor using regular blade attachment. Turn the machine on for at least 30 seconds until a very finely minced pesto sauce is achieved. Set aside. 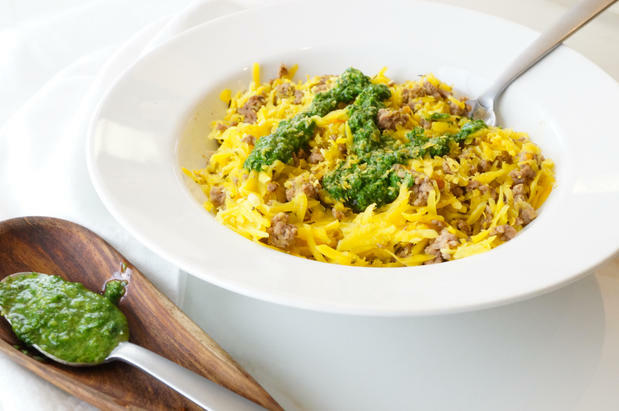 Distribute beef and rice among individual serving bowls and drizzle with desired amount of basil pesto. I personally like a hefty amount because it is utterly delicious and addictive! Serve warm sprinkled with nutritional yeast if desired & enjoy! This sounds like a winner. Cant wait to try. 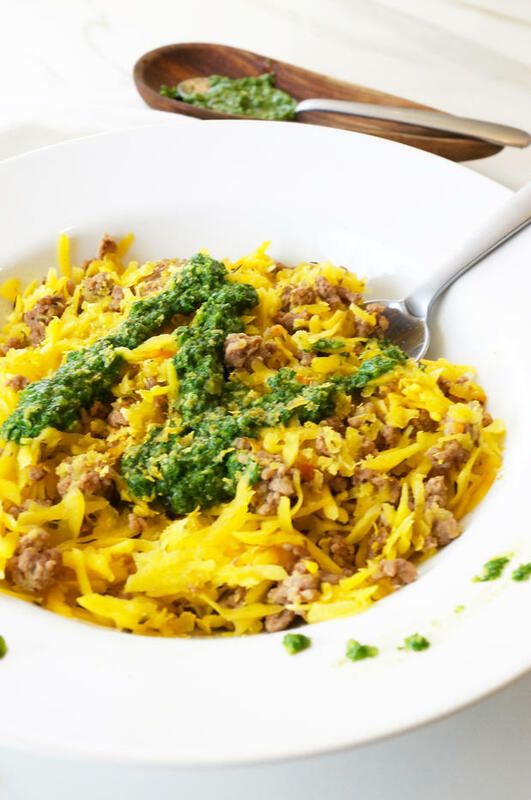 One of my favorites because of how simple & how much it makes (great leftovers!) Enjoy!